Several days ago the Bethesda Game Studio released Fallout Shelter to the Google Play Store. The game has been available on iOS since 6/14/2015 but only became available on Android two days ago, 8/13/15. It was with great excitement that fans of the original Fallout series began downloading and playing the spin-off game. In Fallout Shelter you play the Overseer. As the Overseer you have been assigned a fallout shelter where Dwellers come to live in order to escape from the nuclear wasteland that covers the earth. You are responsible for attracting new Dwellers to your shelter as well as building it further and further underground, maintaining resources, leveling up your Dwellers and the ever important encouraging your Dwellers to make lots of babies. The game is free to play but does have in-app purchases. The in-app purchases really don’t add or take away from the game, they are just there for those who are constantly playing the game and too impatient to wait for the next big thing. Right off the bat the game scored points with me as the first thing that pops up on your screen is a confirmation message asking if you want the game to send you notifications. All to often these types of games send you multiple notifications to draw you back to the game in the hopes that you will spend money on in-app purchases. Yes, you can go into the app settings and disable notifications for the app, but for the average user that is often something they don’t know how to do. The game starts out with a tutorial that goes over the basics and gives you a good idea how to play. Once you are set free to do your own thing the guy from the logo will pop-up and give you helpful hints on new features you uncover. The game was highly addictive and I was sucked in pretty quickly. While you wait it is fun to zoom in on the individual rooms and see what your Dwellers are saying. Sometimes they give you hints as to what they want or need but more often than not they are throwing out tongue-in-cheek comments that can sometimes be funny. 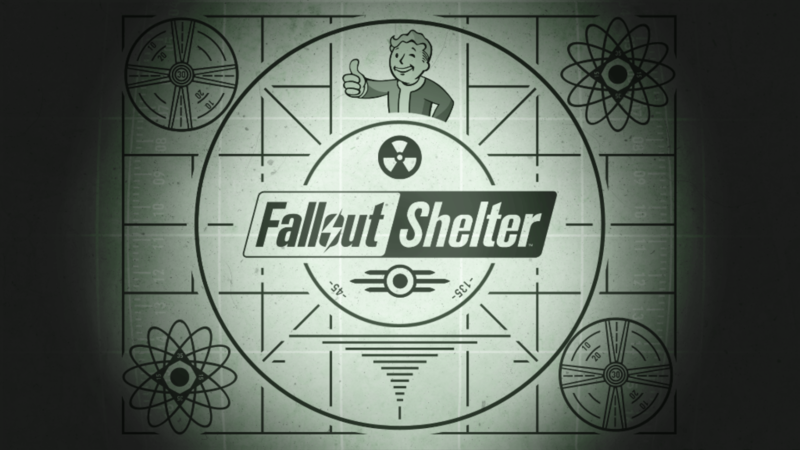 One of the games most important focuses is the growing of your fallout shelter. You need to make it bigger and bigger so you can get more upgrades to get more Dwellers to make it bigger and bigger. In the roughly four hours I spent on the game I had a total of six Dwellers come to the door of my shelter. I had to resort to the games built in method for “quickly” growing your number of Dwellers. You throw a male and a female into a residence together and they start talking. They start to use extremely cheesy pick-up lines on each other, then they start wiggling and moving their arms up and down (I found out later through a mission objective that this is dancing). Once they have danced for a while and their happiness meter is high enough they walk back to a room, hide behind a wall and then green smiley faces start popping up everywhere. A second or two later they come out with the woman waddling along and looking very pregnant. Bethesda threw in a little “adult humor” for the “adults” who may be playing by making this the only way to get your Dwellers to 100% happiness and having them make comments as they come out afterwards. I got the screenshots below of the “adventure”. So what do you all think? Give Fallout Shelter a try and let us know!